Aker Kvaerner - One of the world's leading builders of cruise ships, LNG carriers and container ships. The Group has three shipyards, two in Finland and one in the United States. American Bureau of Shipping (ABS) - Determines the structural and mechanical fitness of ships and other marine structures. Establishes and administers standards known as rules, for the design, construction, and operational maintenance of marine vessels and structures. American Salvage Association (ASA) - Promotes salvage standards, training, safety, regulation frameworks, information exchange and cooperation with national and international trade associations and regultory agencies. American Society for Testing Materials (ASTM) - Provides a forum for the development and publication of voluntary consensus standards for materials, products, systems and services. Committee F-25 on Ships and Marine Technology was establilshed under the auspices of the ASTM, an acredited non- profit management system for the development of voluntary full consensus standards. The Committee is responsible for developing standards, specifications, test methods, guides, practices and terminology for design, construction, operation and repair of marine vessels, structures, systems, equipment and materials. Bath Iron Works - Designers and builders of complex, technologically advanced naval ships. Bollinger Shipyards, Inc. - Marine repair and conversion services. The company operates 14 shipyards, 8 which are ISO 9001 certified, located throughout South Louisiana and Texas with direct access to the central Gulf of Mexico. California Code of Regulations, Title 8 - Ship building, ship repairing and ship breaking safety orders. Cammell Laird - Ship repair and conversion group in the UK. Cascade General - Operates the largest ship repair facility on the U.S. West Coast. Located on Swan Island in Portland, Oregon. Current Contracts at U.S. Shipyards - Maintained by Marine Log Magazine. DCN International - Designs, builds, integrates and supports surface warships and submarines. Delta King - Information on the renovation of the Delta King River Boat, now in Sacramento, California. Det Norske Veritas - DNV is a leading provider of safety and reliability services, where classification, certification, verification and advisory services are key activities authorized to act on behalf of some 110 national maritime authorities. DNV establishes Rules and Guidelines for the classification of ships, mobile offshore platforms and other floating marine structures. It also issues rules and standards for the classification, certification and verification of fixed offshore structures. Elliott Bay Steam Launch Co. - Suppliers of replica hulls, engines and all the gear you need to build your own steam launch. Fincantieri - One of the largest shipbuilders in the world, with twenty shipyards across Europe, the Americas and Asia, and the only one able to build all kinds of high-tech ships: from naval vessels to offshore units, from special ships and highly complex ferries to mega yachts, as well as carrying out ship repairs and conversions, manufacturing systems and components, and providing after-sales services. Germanischer Lloyd (GL Group) - An independent and impartial classification society which supervises safety and quality on behalf of their clients, mainly for ships and for maritime installations. H.W. Ramberg, Inc. - Ship repair, Brooklyn, New York. Huntington Ingalls Industries (HII) - Designs, builds and maintains nuclear and non-nuclear ships for the U.S. Navy and Coast Guard and provides after-market services for military ships around the globe. International Organization for Standardization (ISO) - ISO is a worldwide federation of national standards bodies from some 130 countries, one from each country. 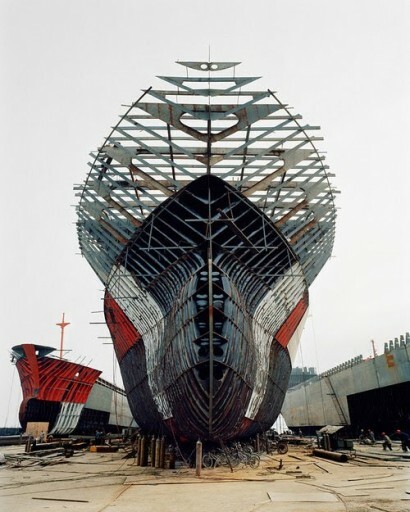 Journal of Ship Production and Design - Technical papers addressing problems of shipyard techniques and production of merchant and naval ships appear in this quarterly publication. Lurssen - A total facility shipbuilder, complete with sales, design, engineering, construction, service, logistical teams and full training service. Marine Electrical Check List - Guide to inspecting marine electrical systems. Marine Money International - Premier maritime finance transactional information and maritime company analysis. Relied upon by shipowners, financiers, investors, ship managers, brokers, lawyers and accountants. MarineWeb - Marine industries resource provides information on boats, yachts, financing, insurance, marinas and boatyards, and ships stores. Maritime Matters: Future Ships - New cruise ships and passenger vessels under construction in the shipyards of the world. Also see Past Ships for pereservation and vintage ship news. Maritime and Shipbuilding - PR Newswire shipbuilding news compilation. McDermott International - Marine construction services, New Orleans, Louisiana. National Marine Manufacturers Association (NMMA) Directory - Directory to 300 manufacturers representing the best in American boating technology, manufacturing, and marketing. National Shipbuilding Research Program (NSRP) - Focuses on U.S. national shipbuilding research and development funding on technologies that will reduce the cost of warships to the U.S. Navy. Newport News Shipbuilding (NNS) - NNS operates one of the most advanced shipbuilding facilities in the world, servicing a wide variety of construction, conversion, repair and overhaul projects simultaneously. NSnet - Shipbuilding and maritime news and information. National shipbuilding network. OSHA: Shipbuilding and Repair - Information on the manufacture, repair, and maintenance of ships. Preserved Naval Vessels in the United States - The list includes US Navy, Coast Guard, and Army vessels, excluding the Army Corps of Engineers. Civilian ships that were temporarily taken into naval service during time of war are included, as are foreign naval vessels and replicas of naval vessels. Small landing craft, ship's boats, surfboats, and similar small craft are not included. Preserved Vessels - This page includes a number of vessels undergoing preservation around the world. Queen Mary - Articles on the renovation of the Queen Mary, now in Long Beach California. Royal Institution of Naval Architects (RINA) - An internationally renowned professional institution whose members are involved at all levels in the design, construction, repair and operation of ships, boats and marine structures. San Francisco Drydock - Inspection, maintenance, repair work and conversion. Seaspan Marine Corporation - An association of Canadian companies primarily involved in coastal and deepsea transportation, bunkering, ship repair and shipbuilding services in Western North America. In addition to the marine transportation services offered directly through Seaspan Marine Corporation, commercial ferry, shipyard and bunkering services are provided via affiliate companies: Marine Petrobulk Ltd., Seaspan Ferries Corporation, Vancouver Drydock Company, Vancouver Shipyards Co. Ltd. and Victoria Shipyards Co. Ltd.
Ship Builders and Ship Repairers Association (SSA) - Represents the shipbuilding industry in the UK. Ship Net International - Information about shipping companies. ShipAuctions - Ships to be auctioned. Shipbuilding History - Documenting the construction records of U.S. and Canadian shipbuilders and boatbuilders. Ships Preserved in Museums - A list of preserved incomplete ships and smaller boats in museums around the world. Shipsworld - Shipsworld enables ship owners, managers, operators, agents, mariners and all other maritime professionals find ship equipment, parts, services, supplies and marine information around the world. Shipyards - Directory and introduction to shipyard facilities worldwide provided by GlobalSecurity.org. Society of Naval Architects and Marine Engineers (SNAME) - Dedicated to naval architecture, shipbuilding and marine engineering, encouraging the exchange and recording of information, sponsoring applied research, offering career guidance and supporting education, and enhancing the professional status and integrity of its membership. Also see Maritime Links page that provide international naval architecture and marine engineering societies and other organizations that promote best practices in the design and use of maritime technology. Standards for Historic Vessel Preservation - From the U.S. Department of the Interior. The document was developed by Michael Naab, under contract to the National Park Service. Technical Aspects of the Preservation of Historic Vessels Conference Proceedings (1997) - Technical papers and reports from Third International Conference Technical Aspects of the Preservation of Historic Vessels. U.S. Coast Guard Acquisition Directorate - Responsible for the Coast Guard's approximately $30 billion recapitalization investment portfolio which includes more than 20 major acquisition programs and projects. Acquiring new assets and upgrading legacy platforms, mission systems and facilities are fundamental aspects of the process of recapitalization, which replaces obsolete and costly-to-maintain assets in order to achieve sustainable readiness in the field. These investments help ensure readiness by delivering (within cost and on schedule) the cutters; small boats; aircraft; and electronic command, control, communication, computers, intelligence, surveillance and reconnaissance (C4ISR) systems that meet specified performance requirements. U.S. Coast Guard Vessel and Facility Operating Standards Division - Develop and maintain standards and regulations for inspected and uninspected vessels, facilities, and offshore platforms. U.S. Naval and Shipbuilding Museum - A resource for Naval and shipbuilding history and news. U.S. Shipyards Directory - Maintained by Marine Log Magazine. This webpage last updated on Monday, August 21, 2017 1:51 PM.